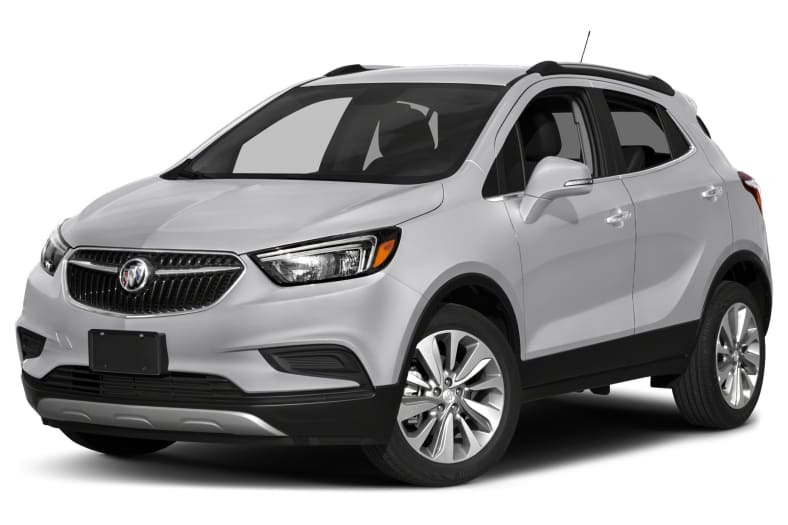 Buick Encore is a subcompact crossover with premium features. When it was introduced for 2013 it was a trailblazer, but the segment has boomed since then. Today the Encore has a lot of serious competitors, for example the Honda HR-V and Mazda CX-3, and the new Toyota C-HR. Encore got a new nose, cabin, and infotainment for 2017, and a new engine before that, but it hasn't been redesigned since 2013. Changes for 2018 aren't big. The Premium model gets an ionizer in its cabin air filter, and every model gets a capless fuel intake. Built on the platform of the subcompact Chevrolet Sonic, Encore is available with front-wheel drive or all-wheel drive, for traction in winter, not off-roading. Encore's handling is pretty good, and the ride is impressively comfortable, for a tall wagon on a short wheelbase. It's a narrow car, which makes the cabin snug, although two adults fit comfortably in the rear. It tries to be upscale, because that's what Buicks are supposed to be. Encore uses two engines, both of them 1.4-liter and turbocharged, but one has direct fuel injection, which efficiently sprays fuel into the combustion chambers. We recommend that one, which will be more common. It is significantly more responsive, making 153 horsepower and 177 pound-feet of torque, compared to the standard engine's 138 horsepower and 148 pound-feet of torque. Both use a 6-speed automatic transmission. Standard features include 10 airbags, a rearview camera, 8.0-inch touchscreen, and OnStar's 4G LTE data connection that can run smartphone apps via Bluetooth, Apple Car Play, and Android Auto. Options include leather, premium Bose audio, and safety options including lane-departure and forward-collision warnings, as well as blind-spot monitoring and rear cross-traffic alert. The engine with direct injection gets and EPA-rated 28 City and 34 Highway miles per gallon with front-wheel drive. The other engine is not only slower, it gets 3 less combined mpg. The National Highway Traffic Safety Administration gives the Encore five stars for crash safety. The Insurance Institute for Highway Safety gives it a Top Safety Pick.